One of my main purposes is to help employers avoid accidents at work, avoid the pain and injury that so many employees suffer, and avoid the prosecutions, costs and penalties imposed on employers as a result of poor safety systems. But sometimes I have to help managers deal with accidents after they have happened. So, Health and Safety at Work IS a serious concern. So what does the law require employers to do in the event of an accident? Many employers keep an 'accident book' which mearly lists an employees name and the injury sustained, but the law today requires that much more information is recorded and a bit more form-filling is recommended in order to demonstrate that the employer has investigated the accident and taken action to prevent it happening again. Keeping such records can also be useful to the employer as supporting evidence against any future claims made by the injured employee. If you are not keeping records like this please contact Wright Safety Solutions. I can provide you with the necessary documentation to suit your business, and I can also conduct an accident investigation if you feel you need some asistance with that. Dealing with accidents is of the utmost importance. The procedure should be the responsiblity of a manager or someone in your business with authority. The procedure should also be well known to all employees and be part of the company's written Safety Policy. An employee has a legal duty to report/record any accident or incident that has or could cause harm or damage. As well as accidents, then, it is also advisable that incidents be investigated and records kept. An incident is an unplanned event which has, at least, caused damage to property. Again, recording the event, this will help to avoid future recurrences and can also be useful evidence to support the employer in any future claims. Now, to more serious events. Under UK regulations, certain types of accidents and other incidents at work must be reported to the Health & Safety Executive (HSE). These include accidents where an employee (or a member of the public) has been killed, or suffered serious injury, and a minor injury which causes abscence from work of more than 3 days is also reportable to HSE. 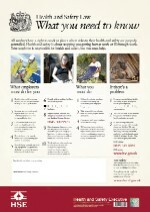 Again, Wright Safety Solutions can help you document and report any type of accident to the HSE. This reporting procedure derives from the RIDDOR regulations: Reporting of Injuries, Diseases and Dangerous Occurrences Regulations (1995) ........ AND there is even more you have to report! Diseases - if an employee's doctor infroms you that his patient has a work-related disease then you need to report this to the HSE. Diseases include: dermatitis, skin cancer, asbestosis and other ling diseases, legionella, hepatitus and certain musculo-skeletal disorders derived from improper manual handling. If you are uncertain if an employee's disease or complaint is work-related then contact Wright Safety Solutions. If you are uncertain if an incident can be classified as a dangerous occurrence then contact Wright Safety Solutions. There is a lot of uncertainty within small/medium busineesses of what to report, and indeed sometimes a reluctance to submit reports. I can only advise to take good regard of the law, and contact me if you are at all uncertain. To ignore accidents and incidents and not report dangerous occurrences can have serious consequences. If one of your employees was to suffer an accident the cost would depend on the circumstances, but costs of around £100,000 are common. There are case histories discussed in our Newsletter page, look for the link later. The most common cause of injuries at work is the slip or trip. Resulting falls can be serious. They happen in all kinds of businesses, but sectors such as food and catering report higher than average numbers. It’s a particularly important subject if members of the public use your premises. The estimated cost to UK employers of all these injuries is over £500 million a year, and insurance only covers a small part of this. Such a huge cost to UK industry - yet the effective solutions are often simple, cheap and lead to other benefits.